Today I’m going to be talking about some customers that I’ve been keeping an eye on for a while, and they are @the_bohemian_blue_hut on Instagram, these customers have done an amazing transformation of our Shepherds Hut 600 into a true bohemian fantasy. From getting the delivery and being ready to install your cabin/shepherds hut, we always recommend to start looking at the plans and identifying the parts needed throughout. As shown below, all of the parts were laid out for the wheel frame for the hut, then the floor joists and floor were laid down. By the next picture you can see how fast it can be to install one of our Shepherds Huts, the paneled design allows you to position the windows how and where you want them in a timely manner. From walls to roofing, the process seems to flow one step into another – These customers also added insulation in the wall panels. We recommend using 35mm – 45mm Celotex (or similar) insulation in the walls and rockwool in the roof, allowing you to increase the heat capacity and usage possibilities of the Shepherds Hut. Our Shepherd Huts were made with insulation in mind, with the supports of each panel sticking out some, you now have the ideal size for getting your insulation even. To hide the insulation in the walls you can then essentially ‘twin skin’ the shepherds hut, either by using plywood or 8mm pine cladding to build a new wall. From this point is where the true transformation takes its shape. These customers created picture frame-esque framing to create a vintage style which when painted, really makes the hard work paid off- Making the walls appear naturally vintage. Two colours of paint were used for the interior, using a lighter colour of blue as the base they then painted over with a rich blue shade. The effect from using chalk paint allowed these customers to achieve a naturally weathered look, and I can’t believe I never thought of that myself! The exterior of the Shepherds Hut was painted using a green exterior paint, giving the exterior a natural look, suitable to suit the surrounding lake and woodlands. (Which in itself, is the perfect setting for this building). The contrast from the natural exterior to the bright and bold interior, to give your guests a little surprise. The Bohemian style has certainly made a comeback in the recent years, and I’m personally not mad about it – The modern Bohemian style consists of a few main points: Colour, Contrast and Pattern. Along with the vintage theme, these customers used a bright blue as the base for their hut, then they created their contrast by using colours ranging from pink, red to orange for their accessories. Some elements of this project just oozes vintage luxury, from the hardwood sink cabinet and tables, the board games all the way to the lighting, each piece was chosen with the theme in mind. I also love the touch of Moroccan styling with the gold patterned curtain frame- Afterall, Moroccan aesthetics were highly praised for their luxe bohemian look in the mid 2000’s. Did I mention that these customers also added plumbing and sewage access to this hut, allowing them to make a dainty, but certainly usable bathroom. All pieces for the interior design was chosen with the primary colour of blue in mind. What we now see is a transformed Shepherds Hut with a distinctive theme- A perfect theme for extra accommodation, for those few nights away when you just want to be closer to nature and to yourself. As of last week, these customers opened up their Shepherds Hut for guest bookings on Airbnb, and with a cosy bed like this, I think these guys will do well with their future of hosting. They even managed to introduce the patten element of Bohemian style with the bedding. I know for sure that I’m starting to feel creative again after looking through this transformation, are you? If your brain is budding with ideas on a transformation, you can look into using the Shepherds Hut 600cm as the base for your project. Or if you worry that 6m won’t be enough space for your ideas – We have recently added an 8m version of our Gypsy Wagon. Hello everyone! So as you may be aware- It’s coming up to the season where we start making the finishing touches to our new catalogue! When these are all completed we will work hard to put the products on our website for you to browse and order. However, in the meantime I have created this snippet showcase of some of the products we are excited about for the upcoming year. If you did want to have a sneaky peak our Tuin 2019 Catalogue is available to read online whilst the physical copies are in print. Please note that your device will need Adobe Flash to open the online brochure. We’re always thinking of ways to improve our Garden Furniture, from comfort to the prevention of mould growing from damp cushions. This is why we have expanded our aluminum framed range and implemented a powerful combination of Textilene fabric with Quickdry foam cushions. Textilene is a PVC coated woven polyester, formulated to withstand the most severe weather conditions as well as wear and tear for many years of outdoor use- all with minimal maintenance needed! Quickdry foam has been specifically designed for outdoor use, unlike normal foam, Quickdry foam drains water quickly allowing cushions to dry faster and prevent mould growth. Clean in design, the Colorado Springs set is split up into separate modules. Allowing you to do a ‘Pick ‘N Mix’ selection and build your own custom lounge set. Paired with Textilene material and Quickdry cushions, you can sit in the sun with comfort – Along with the metal butler trays on some modules, so you don’t have to worry about if your drink will topple over. Dine in the sun with the Montgomery dining set featuring six chairs made from aluminum framing along with a 2m long table to fit all the dishes. You can relax knowing that your Montgomery lounge set won’t stay wet for hours, even days. Have you been dreaming of one of our Love Seats but don’t have the space for the whole width? A simple yet elegant furniture set, the Fermont may be the solution. The simplicity gives this garden furniture set a striking appeal, ideal under a veranda or on your balcony to make star gazing more comfortable. Quirky in design, the Riverside set is split up into separate modules. Allowing you to do a ‘Pick ‘N Mix’ selection and build your own custom lounge set. Made from the very appealing Teak timber to ensure a long lasting lounge set for years of use in your garden. 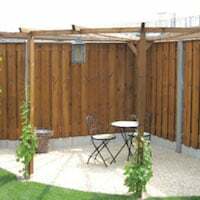 We also have some new additions to our Garden Fencing range – The most notable ones are made out of Larch timber, which is always stunning in colour and durability. 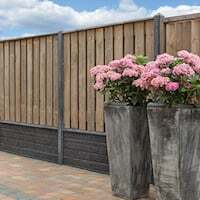 Modern in design, but effective – The Klagenfurt garden fence features 28 smoothly planed boards in each fence panel. Creating this smooth but busy looking fence panel, perfect for keeping your garden to yourself and blocking the outside world out. Featuring an asymmetrical apex roof – The Tane Log Cabin provides customers the best compromise between price and heat capacity, being made from 40mm logs and double glazed windows. Paired with some insulation in the floor and roof, you will have the perfect start to your own, quirky summerhouse. Made from 70mm thick logs, the Ennis Log Cabin is an ideal cabin for overnight accomodation, or the ideal base for your home business. Measuring at 5.3m x 5.4m, the Ennis is made up of four internal rooms to allow the essentials to have it’s own designated space. Do you want a Log Cabin that’s filled with natural lighting? Then the Letterkenny Log Cabin may be just what you’re looking for. With a total of ten tempered double glazed windows around the front and back of the cabin, as well as the doors featuring glass fronts – It’ll be safe to say that when paired with the right location, natural light will brighten up all four rooms of this Cabin. Perfect for lakeside accommodation, or an office that overlooks the countryside! With the same classic design as our Shepherds Hut – Gypsy Wagon model, the Gypsy Wagon XL has a total with of 8.2m! Perfect for those who love to transform their Shepherd Huts into overnight accommodation. The Gypsy Wagon XL is also compatible with our Shepherds Hut Accessories, allowing you to add internal partitions, extra access and more. And this is just a few of our new products for 2019 – Personally I’m the most excited about the new additions to our Shepherd’s Hut range, as well as the way our customers transform them! What are you looking forward to the most from this new catalogue? Of course I can’t spoil everything for you, but if you just can’t wait any longer to find out you can read through our Tuin 2019 Online Catalogue. We hope that 2019 will bring us new and returning customers to surprise and delight with again and again! Recently a few of my co-workers as well as myself traveled to Holland again, to see Tuindeco and hear about their developments over the past year. And once again, I was blown away with their developments every year – Some of which I will talk about in this blog post. It started off with the usual ferry ride and the drive to Coevorden, and although the ferry ride was bumpy- I was lucky to catch the long straw, which allowed me to read during the whole journey. Once we got there, we were told the recent developments within Tuindeco- As well as being able to view their latest showsite design. Every year Tuindeco grows, especially in a physical form, for example this video below shows their latest build project of two new warehouses. Both are massive in size, allowing them to build up stock in these quieter winter months- The development of these warehouses are planned to be finished early next year, ready for the spring and summer season. And even with their developments of new warehouses, their current ones are still striving – With various techniques put into place to ensure the quality standards of our products. Industrial power fans have been placed around the Larch timber in order to keep them nice and dry in the rainy months – Preventing the signs of weathering and the possible chance of mould growing. Along with new packaging styles that are being tested, such as this crate-like structure around the Edelweiss log cabin package, hopefully reducing the probability of the log cabin getting damaged during transit. During our drive around the Tuindeco warehouses, we spotted something in the distance- So bright that no one could miss it… It turned out to be a Tuindeco minivan, a promotional vehicle for their 25 year anniversary, and although the weather doesn’t match the brightness of this minivan- It certainly brightened up our day! After this tour we all went our separate ways in order to do the tasks we came here to do – My task was all about their show site. Armed with a 360° camera, I was able to capture and put together a 360° showsite walkthrough. Unfortunately the weather was cloudy and the showsite was in the middle of upgrading for the new season- But there is still plenty to see, you can find and use the walkthrough on our Tuin in pictures page! Along with a walkthrough of our showsite that’s based in Brooke, Norfolk. What is envious about the Tuindeco showsite is the amount of space they’re able to use, in fact, they even had to room for one of our longest buildings at 14m – The Slane Log Cabin! Stunning in person, but I also captured a 360° walkthrough of the cabin, which can be found under the video tab of the product page. 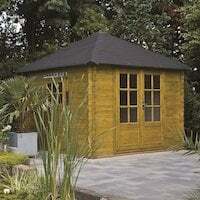 A traditional style for roof type, Our Larch Apex roof garden building range starts first with the basic structure and then various modules can be added to it to create walls, infills, extensions etc. A roof type inspired by barns – The asymmetrical apex roof larch timber comes from well managed forest and is one of the most durable softwood species. It has a very warm colour and texture. But who wouldn’t be? Nevertheless the the trip to Tuindeco was a success in my eyes, with plenty of pictures taken plus the creation of two 360° walkthrough tours, the consumption of Bitterballen and dog petting- It’s hard to list that as a fail. Feel free to let us know your opinion of the new walkthrough tours by commenting on this post. If you’re still curious about Tuin and Tuindeco, you can read more about how we operate from our Tuin About Page as well as the Tuin and Tuindeco in Pictures page. The heatwave continues to beat our expectations – And so do our customers! Installing their Log Cabins in this heat, determined to see the finishing result. For example, Mr S’ installation of their Gijs Log Cabin. With plenty of pictures to back up his words, but need I say more? Lets read what Mr S has to day about our Log Cabins. I chose to buy the Gijs from Tuin for a few reasons, I’ll list them in case it helps anyone else. Website – I love all the reviews, advice, blog, instructions etc on the website. By far better than anyone else in this market. Service – They look like a company that cares about their customers. They do, I have been very impressed. I wasn’t disappointed and would thoroughly recommend this cabin. I thought I would contribute to the website by offering my thoughts on the build process, and some photos. I hope someone finds this interesting or useful. I have a sloping area at the back of my garden where the cabin was going. I really didn’t like the idea or expense of excavating and laying a concrete slab so having read the website advice and doing some other homework decided to use pads with a wooden framework on top. I also wanted to install a decking area under the canopy so the foundations I needed were almost 6m x 6m. I used 2 different kinds of pads. 6 of them (4 corners of the cabin plus middle of the front and back walls) were excavated to about 30cm deep by 50cm square, then filled with concrete. I then sank a couple of those hollow construction bricks into the concrete and filled the holes with concrete. The other pads (about 16 of them) were expected to take less load, so I made these by laying some sharp sand and placing a concrete paving slab on the sand, then building up from there using dense concrete bricks. I didn’t bother using mortar – I’m no brickie and my builder friend said they would be fine! If you are using a similar method I strongly recommend taking time to ensure they are all level, it saves a lot of time and hassle later on. After this I put a layer of weed suppressing cloth down so hopefully nothing will grow underneath. I then built the frame using treated 2 x 6″ timber from the builders merchant. I put a double thickness on the edges where the cabin walls would be. Possibly overkill but I like things to be solid. I needed to use a few wedges here and there to make sure there was contact between all points on the frame and the pad foundations. At this stage I also build the frame for the stairs that will lead up to the deck. I am a relatively keen DIYer and found the foundation stage hard work physically, but quite rewarding. I haven’t built any foundations before, and had to put up with some sass from my builder friend who thought I’d over-engineered everything. He may be right. I have helped a friend build a similar cabin so knew roughly what to expect. First stage was delivery. I made one mistake at this stage. I stacked everything horizontally at the bottom of the garden except the doors, which I stood in the house for a couple of days before the build. It was only after they warped that I read the advice on storing them flat. Store them flat! The build is really straight forward if there are two of you – more pocket money for my son. Some of the wall pieces were hard to get in due to warping but could be fixed with some clamping and hammering as advised in the build video. We had the walls and about 1/3 of the roof completed on the first day. Be very careful of the ends of the apex pieces. They are held on by a very thin strip of wood and break easily. I broke two of them off. It didn’t make a difference to the build and I was able to stick them back in place for the cosmetic look after it was finished. One problem I had was getting the purlins to sit flush with the walls. Mine were a bit warped and didn’t sit all the way down. The website advises getting a plane out, but I wasn’t too happy about that. I ended up coming up with my own solution of laying draught excluder tape along the front and back walls so that when I added the roof beams, it closed all the gaps. There’s certainly a better solution to this, but it seemed to work for me. Finishing the roof seemed to take ages, but I was very glad I owned a nail gun. Mine’s a weedy electric one so I alternated between the proper clout nails and my nail gun to make sure it was solid. I then cracked on with laying the roof shingles. Again I found this quite straight forward, just a little time consuming. I decided against insulating the roof because I’ll mainly be using the cabin as a workshop and I don’t get cold easily. What I didn’t consider however is heat! We’re in the middle of the 2018 heat wave and the black shingles act like a giant radiator – the roof is hot to the touch on the inside. Maybe next time I might put a layer of insulation up there. I did decide to insulate the floor. I cut OSB board to hang between the joist then cut up sheets of expanded polythene to fit into the voids. Over that went a layer of plywood screwed to the joists, then an engineered wood oak floor that clipped together really easily. It looks lovely. After quite a few test pots we finally opted to use Sikkens HLS (1 coat) and Sikkens Cetol 7 (2 coats) in light oak. It has a slight gloss/silk sheen to it which I like but won’t appeal to everyone. An excellent product from Tuin at a very reasonable price. The quality of the boards was excellent with a handful of warped ones. Service, before during and after has been outstanding and I wouldn’t hesitate to recommend Tuin or this cabin. If I were to do anything different in the build process I would spend more time getting the foundation pads exactly in the right place, square and level. A couple of mistakes cost me some time and headaches later in the build (including the use of a car jack to lift one corner up while I put in some shims!). Best of luck with your builds! A very appropriate treatment choice for this Gijs Log Cabin and a beautiful setting to pair with it! Thank you to Mr S for sending in their honest review of their experience with installing their Log Cabin. Interested in more reviews like Mr S’? You can find a load more at: Tuin Pictorial Customer Reviews. Due to the popularity of our recent Log Cabin Pubs blog post, I decided to continue with this concept as a sort of series- Showing some of the main ways that our customers have used their Log Cabin for. This example being, as the title suggests, hot tub covers! Hot tubs have had increased popularity over the past couple of years after seeing our western neighbours use them as one of the ultimate relaxation must haves – Though of course, we don’t want to be sunburnt in the process.. Nor wanting to clean out all of the leaves that will land in everyday, hence why a lot of our customers have found our products as the ideal solution. This is our Rianne log cabin.The 2.5m gazebo is a perfect for size for you hot tub while the having the cabin dimensions of 2.5m x 2.5m that can be used for a range of purposes including: garden pubs, summer house or as general storage. 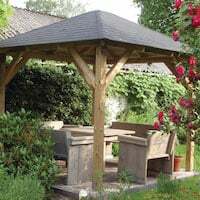 This is our Syros Gazebo made from untreated larch, meaning that it will weather through time similar to how oak does; however if you want to preserve the rich colour of larch then you can treat it with products such as our Carefree product, this can help protect the wood from the elements of nature. This Syros has been shown to be used for a hot tub cover that will be a stylish and an effective solution. The addition of shingles that can give it a rustic look that cannot be said for plain roofing felt, not to mention the longitivtiy of your Gazebo and it’s roof. 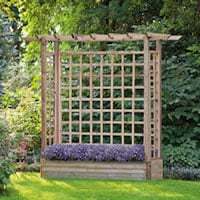 A cheaper alternative for the Syros Larch Gazebo is this Wooden Pergola. This is smaller but can be use-full for those smaller areas around your garden, at 3m x 3m pergola you still have plenty of room for your hot tub. 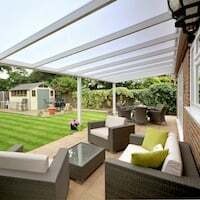 Due to the roof material being polyethylene, we would recommend to use this as a temporary/seasonal solution, due to the pergola being less structurally stable compared to our gazebos. The Marit Log Cabin Gazebo (4m x 4m) is similar in size to the Syros, however, you can gain some privacy and peace of mind with the additional walls, depending on where you position the Marit gazebo- You can also benefit from the additional protection of the side walls from the wind and potential rain. These pictures are of the Barbara Log Cabin Gazebo which is 3.5m x 3.5m that can, just like our other Gazebo’s and the pergola, be converted into a perfect hot tub cover. This Gazebo is like the Marit, however, this Gazebo has a flat roof that many people can think of as more modern and stylish. This style also benefits from a low log cabin height, which is ideal to be able to install this without the need of planning permission (always check with your local council). The feature of the side walls, like within the Marit, can give you more privacy. This Elburg Log Cabin is bespoke within this picture, with the addition of the extra doors on the gazebo side of the building. The Elburg normally only have them on one side, however that small factor doesn’t stop anyone from adding them in order to increase the usability potential: this could be as a hot tub cover as shown as below, a summerhouse with outdoor dining as well as a general storage use. These two hot tubs images are from the Mega modern log cabin which measures at 5.75m x 3m which makes it almost ideal for your hot tub, if you’re quiet you could probably hear it calling to be used for a hot tub cover/storage. A factor that is nice about this is that, like many others it has an outdoor area, however due to the mega moderns size, its proven to be ideal for the end of your garden, a secret get away for the summer. It also makes a nice change from having a hot tub under the gazebo, allowing you to use it during other seasons. The Annette Corner Log Cabin is another product with a modern design. This log cabin is 7m x 4m making it a good size for those slightly larger gardens, and every slightly larger garden needs one thing… a hot tub! As luck would have it, this desirable timber structure can easily be the hot tub cover that you need. This final picture is of the Rosenheim Log Cabin which, like the others has been converted into a cosy hot tub cover that looks like it could be the beginning of a brilliant time, the log cabins size of 3.8m x 3.8m is comfortable for most average sized hot tubs and can fit in most gardens, its style can make it look like its a small old fashioned house that would fit in almost anywhere. The lighting to this Rosenheim Log Cabin is what really pulls this all together, setting the mood to a romantic and relaxing one. Perfect for those with a stressful lifestyle- Just go into your garden and enter your Cabin of relaxation. As well as this Meaghan Log Cabin, freshly installed. The Meaghan Log Cabin measures to 4.5m x 4.5m, the ideal size for a hot tub enclosure – And the positioning of the roof skylights are just perfect. Allowing you to look up at the stars without getting so cold in the night. These are just a handful of the images our amazing customers send us, if you liked viewing these- Follow our Facebook, Twitter and Instagram pages we also have plenty of boards on the Tuin Pinterest page. If you’re not looking for a hot tub cover, there are plenty of other ways to utilise a Log Cabin, see our Log Cabin Pubs post for a collection of how our customers have transformed their Log Cabins into a garden pub. Out Uses Of A Log Cabin post can also provide plenty of inspiration! On the Wolfgang Log Cabin product page, we like to give you the nitty gritties of the product in terms of dimensions, technical installation tips and the best feature of said product. 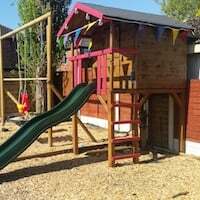 But, on this page we let our previous customers voice their opinion on the Wolfgang Log Cabin and let them show you their thoughts, ideas and pictures! So here goes. The installation for the Wolfgang Log Cabin is a simple process, so long as you keep organised. You can find loads of information in order to be fully prepared for installing your Log Cabin on the Essential Installation Manual as well as plenty of other Log Cabin Fitting Tips throughout the blog, from our expert (practically), Richard. If you would like to see more photos from customers please click on the picture below – Note: This will take you to our customers photo gallery hosted by Google Photos. Pictures may show older models or customer own modifications. 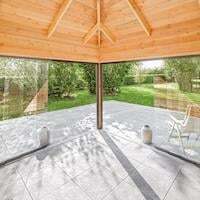 The 45mm double glazed wolfgang, paired with Roof and Floor Insulation is a recipe for a perfect summerhouse! For more details such as measurements and the breakdown of what comes within the self build kit, please look at the Wolfgang Log Cabin product page. If the Wolfgang isnt quite what you imagined for your garden, discover the Clockhouse Log Cabin and the Lukas Log Cabin. On the Lukas Log Cabin product page, we try to give you every detail needed to show you why you would want the Lukas in your garden. With dimensions, technical tips and some customer images. Made from 34mm logs and comes with an adjoining shed to the side. 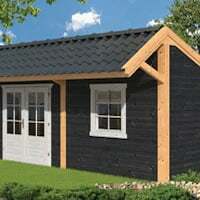 The Lukas 34mm log cabin with adjoining shed measuring 4.4m x 3.0m with a 50cm porch area to the front. The integral shed area measures 1.50m, making this both a stylish and useful cabin. It comes with a double half glazed door, one single half glazed door and one double window. 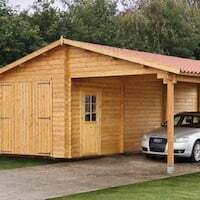 The log thickness and adjacent shed makes the Lucas Log Cabin ideal as a summerhouse. Mr W’s Lukas Log Cabin experience. Mr A’s review of the Lukas Log Cabin. So long as you keep organised, calm and have read the Essential Installation Manual as well as some of the other Log Cabin Fitting Tip pages throughout the blog- your installation of the Lukas Log Cabin should be a simple process. If you would like to see more photo’s from customers please click on the picture below – Note: This will take you to our customers photo gallery hosted by Google Photos. Pictures may show older models or customer own modifications. It’s clear as to why the Lukas makes an ideal summerhouse or work/craft room- plus the height of 2.36m makes it ideal for UK gardens! 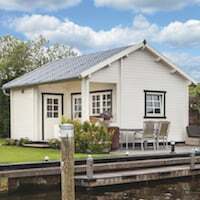 For more details such as measurements and the breakdown of what comes within the self build kit, please look at the Lukas Log Cabin product page. 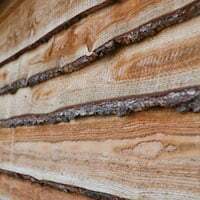 If you’re looking for something with a thicker log, maybe you’ll benefit from looking at: Aiste Log Cabin Feature or the Stian Log Cabin Feature. Proudly powered by WordPress Theme: Integration with X-Cart.